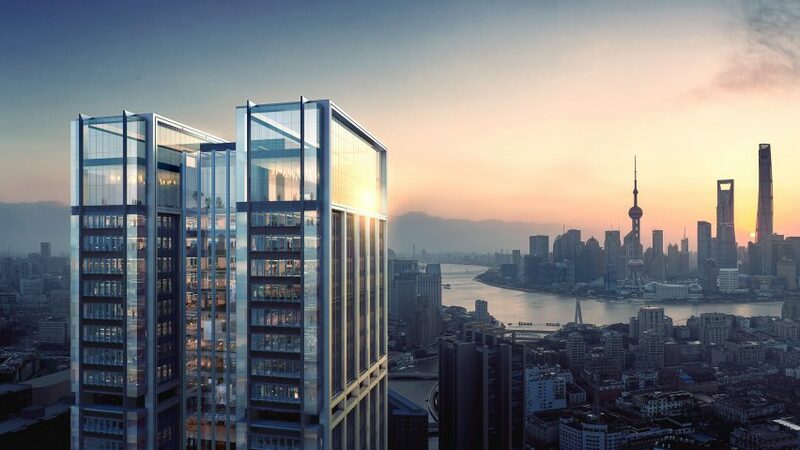 Work has begun on a 200-metre-high office tower designed by Foster + Partners in Shanghai, as part of a regeneration programme in the east of the city. The 42-storey tower is being built for property development company China Resources Land in the Shanghai's Suhewan district. It will be the first office tower in this primarily residential area, and is intended to be the centrepiece of the Suhewan East Urban Complex. The tower's facade has a stainless steel structural frame that was chosen to reflect the industrial aesthetic of surrounding buildings and bridges. Dark glazing will complete the look and reduce glare from the sun bouncing off the glass tower. A recessed centre will split the slender tower into two wings and allows natural light to reach the centre of the offices. Lifts will rise to the rooftop, which will have views out over the Huangpu River and The Bund waterfront area. At lower levels offices will look out over the greenery of the new Suhewan Park. "We have designed the building in the most flexible way possible to accommodate the changing nature of the workplace," explained Foster + Partners head of studio Gerard Evenden. "The floorplates have been designed to enhance collaboration and communication, with special emphasis on natural daylight, as organisations look towards healthier and more open spaces to work." Shanghai's government has undertaken a drive to make the city a top financial and technology centre by 2020, and drawing development to the eastern quarter is part of this vision. "In consonance with the city's future vision for the area, our focus has been to provide a modern landmark inspired by its rich history and industrial past," said Evenden. Foster + Partners recently completed an arts and culture centre with a moving facade of bronze pipes on The Bund in collaboration with Heatherwick Studio.